Several readers have raised questions relating to my post dealing with the Intercept Method. These questions mostly concern the relationship between altitude and zenith distance and also the relationship between angular distance and the nautical mile. Since several chapters of my book Astro Navigation Demystified are devoted to answering these questions, it is very difficult to cover them in one relatively short post. However, the following attempts to provide the answers in as concise manner as possible. The Relationship Between Altitude and Zenith Distance. We usually consider azimuth and altitude from a position on the surface of the Earth. To fully understand how these phenomena relate to the LHA and declination of a celestial body and hence, how they help us to establish our position, we need to consider them in relation to the celestial sphere. 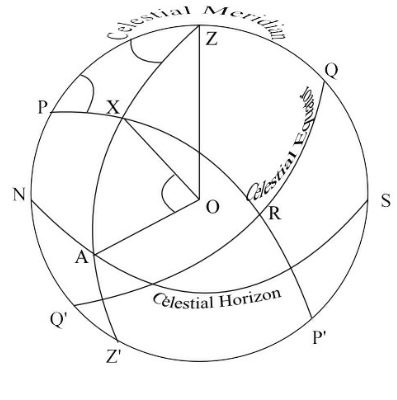 The celestial sphere is drawn in the plane of the observer’s meridian with the observer’s zenith (Z) at the top. Point O represents both the observer and the Earth. The arc PZQSP’ represents the observer’s celestial meridian. The arc NAS is the celestial horizon and QRQ’ represents the celestial equator. 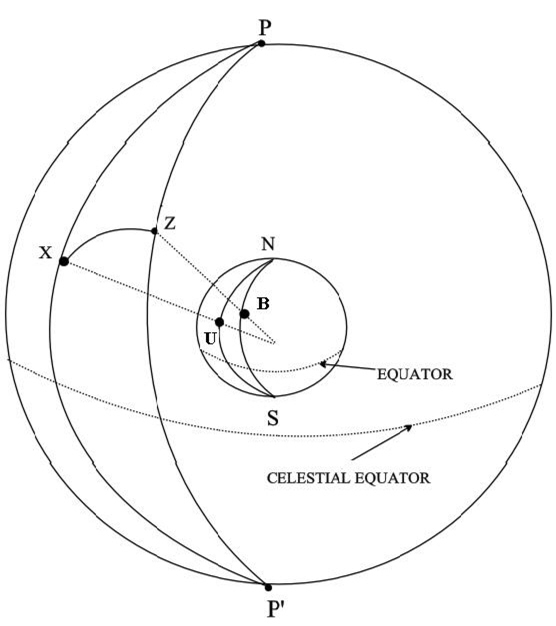 ZXAZ’ is a vertical circle running through the position of the celestial body (X). (A vertical circle is a great circle that passes through the observer’s zenith and is perpendicular to the celestial horizon). The Altitude is the angle AOX in the diagram; that is the angle from the celestial horizon to the celestial body measured along the vertical circle. The Zenith Distance is the angular distance ZX measured along the vertical circle from the zenith to the celestial body; that is the angle XOZ. Expressing the Angular Distance of the Zenith Distance in terms of Nautical Miles. Refer to the diagram below. Angle ZPX is the local hour angle and side ZX is the angular distance subtended by angle ZPX. So, if the hour angle is 10o , the angular distance ZX will be 10 x 60 minutes of arc and since 1 minute of arc subtends a distance of 1 nautical mile on the Earth’s surface, ZX will be 600 nautical miles in this case. 60 nautical miles or 600?